Today I'm using a beautiful set of china from my husband's grandmother. It's Shelley Ning Poo, an art deco design from the 1930s. 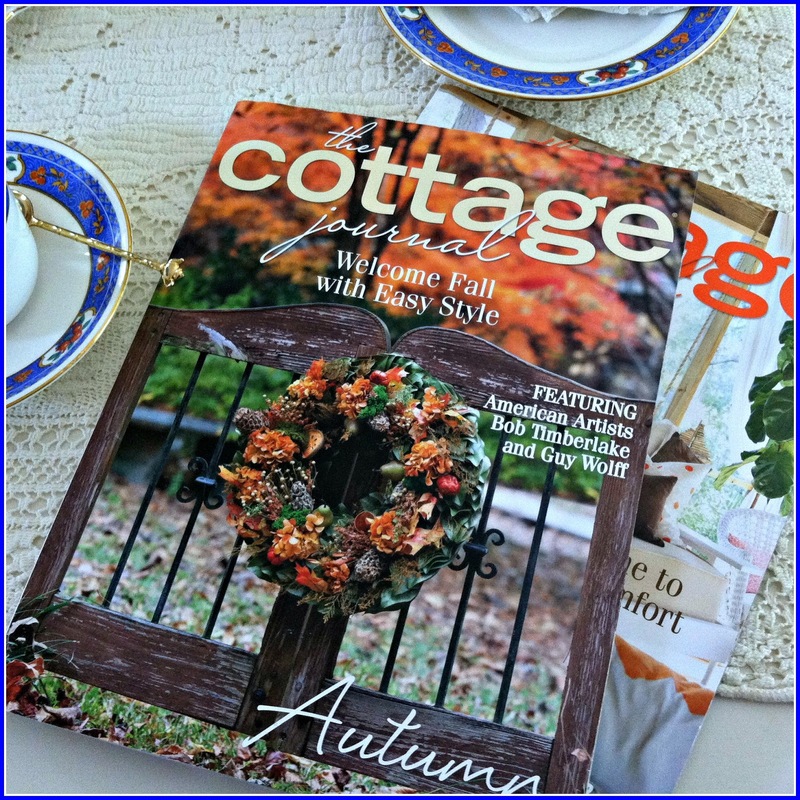 A perfect time to sit and peruse the two Cottage Living magazines that I won in Patti's (Magnolia Cottage) giveaway. If you haven't met Patti, please stop by. She has a lovely blog, and is an old movie aficionado. I just got a great recommendation for an old Cary Grant movie from her. 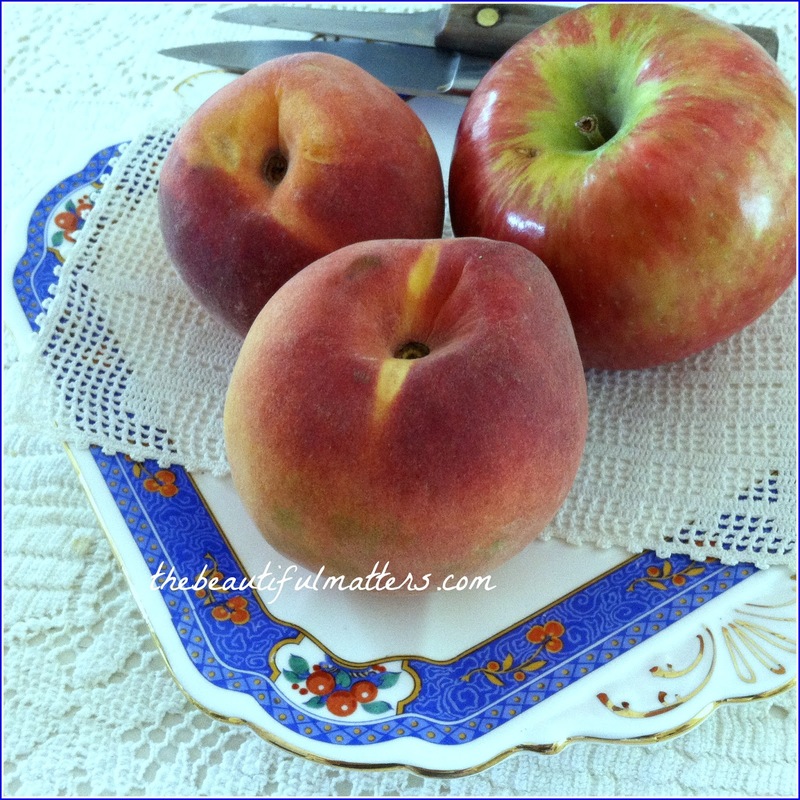 Let's enjoy a delicious Honey Crisp apple or some southern peaches. This is the pretty bookmark Patti sent with the magazines. We went to the apple orchard last week and got two bags of Honey Crisp apples. And cider and cinnamon donuts, a must when you're at the orchard. Mr. Beautiful got stung by a bee. They are out in full force when cider is being poured. Thankfully, he doesn't experience any swelling or other issues. A couple weeks ago, one of my husband's clients invited us to see violinist Itzhak Perlman play at Hill Auditorium in Ann Arbor. It was fabulous. So much talent. Here's a picture of what they called a "gingersnap pumpkin shooter" that I enjoyed at the pre-concert nibbles and drinks thing-y. It's crumbled gingersnaps topped with pumpkin mouse and whipped cream, served in tiny little cups. So cute, and seems like it would be easy to re-create. Speaking of cooking, I made a chicken curry that was so delicious and homemade naan bread last week. Naan bread is expensive in the store, and this was so easy. I'll share some photos and a recipe later. And I finally got my linen tablecloths organized to my satisfaction. Will share that, too. Linking with Sandi and Ruth today. 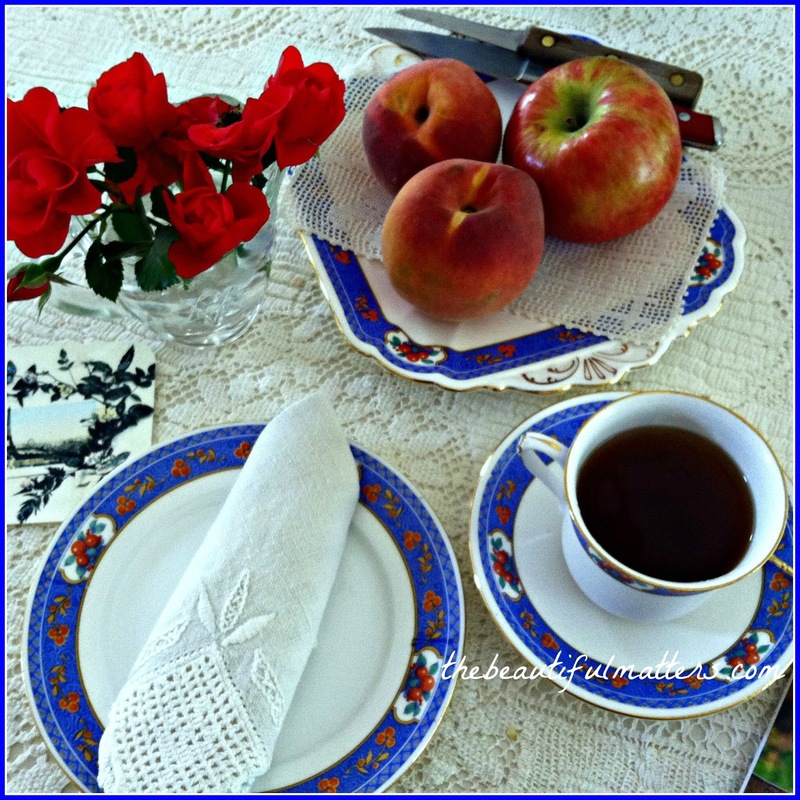 Check out some of the loveliest tea parties and nicest bloggers in blogland! Hi Deborah, wow what pretty china! I love apple picking and sorry to hear about Mr. Beautiful getting stung by a bee. I will check out your friends blog now. Have a wonderful week. The china is a real treasure...so pretty! We love honey crisp apples too. Hope you have a nice week. 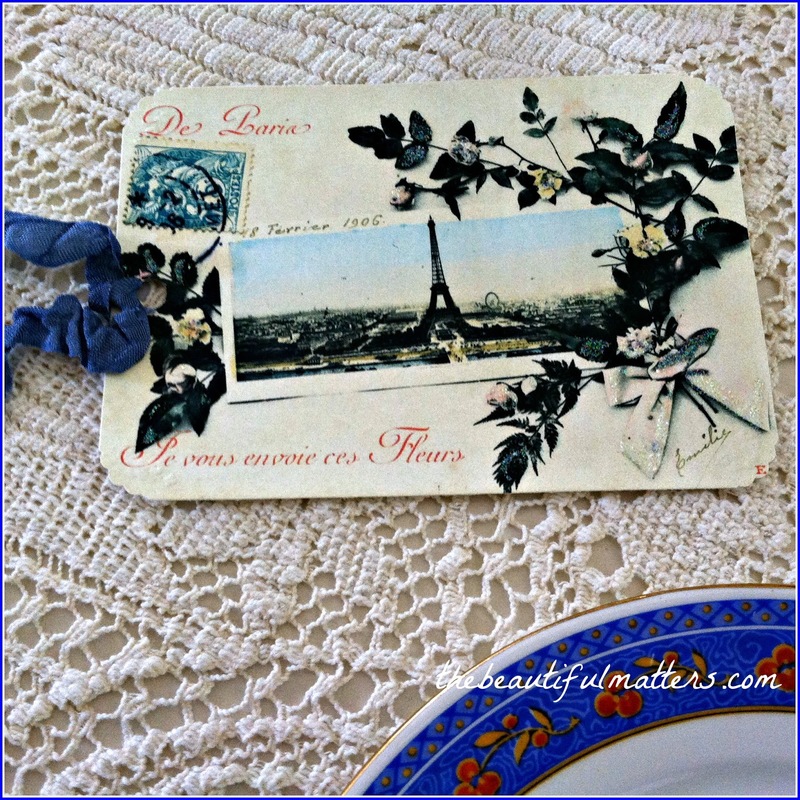 Lovely post, Deborah! Such beautiful china...makes everything taste so much better! Yum... pumpkin mousse.. and you have a recipe for naan bread. I'll be watching for that!! 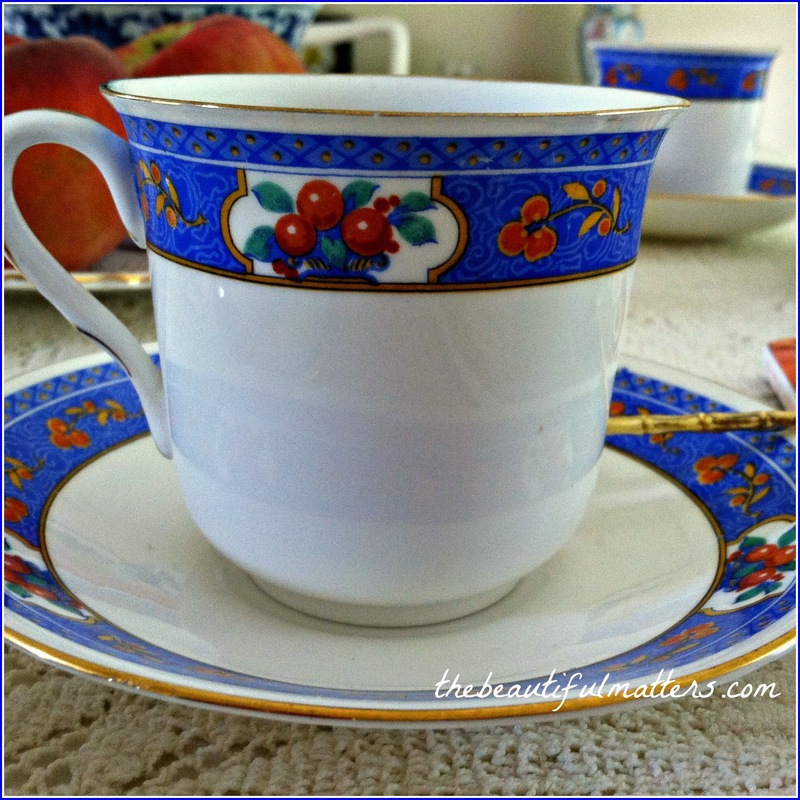 The colors in the china are bold and beautiful! I plan on taking the Grands to an orchard in a couple of weeks.. the pumpkin gingersnap shots look yummy.. Around our area the Dairy Queen restaurants have pumpkin pie blizzards... they are so yummy! I have never heard of naan bread. I cannot wait to see a pic..and the recipe. Have a great week. Blessings! Not only the beautiful china from your husband's Grandmother, but also the lovely crocheted lacework of your table square. Is that an heirloom too? Beautiful china. And did I spy some Apostle spoons? A pretty potpourri of a post, Deborah! How I miss all the fall fun of apple picking, and then enjoying apple pie, a hayride and other autumnal activities, which were always anxiously anticipated during my childhood in Canada! Thanks for sharing and have a lovely week! Really beautiful china, I got my set out for the first times in ages today. Sounds like a great trip out to the theatre. I love making naan bread and curry... a favourite meal for us! Your china is beautiful. What lovely family heirlooms to treasure. Hi Deborah. LOVE your china...of course! And so perfect for your fall table. We are big curry & naan eaters here...being Brits is always around. Love making homemade! Nice to see the Cottage Journal...used to get the email before they started publishing. Will have to look for it. Thanks for linking to Tuesday Cuppa Tea! 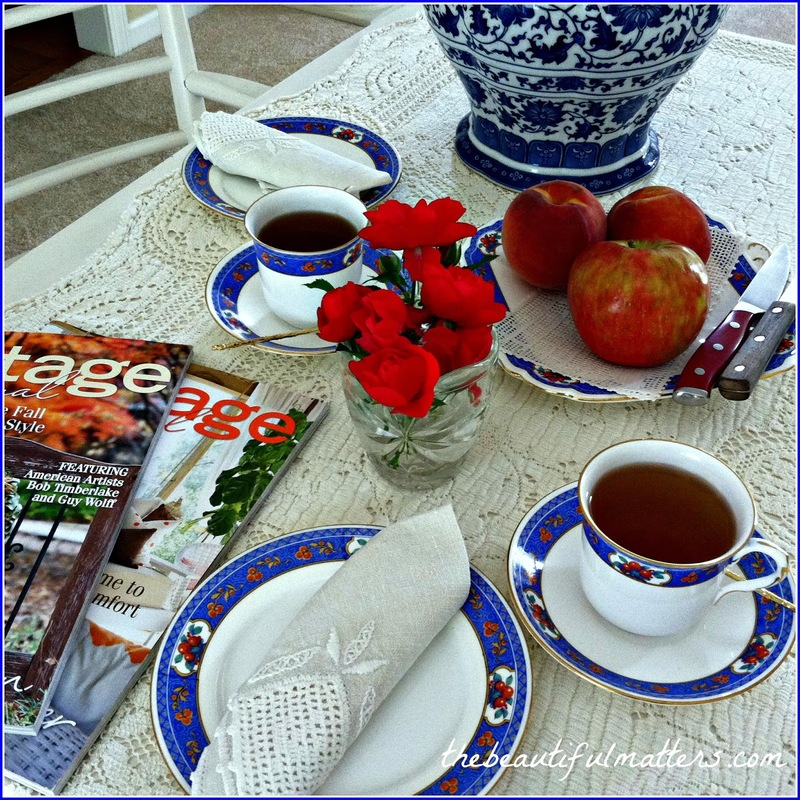 What a lovely tablescape with this gorgeous china. I had a honey crisp apple just yesterday...actually had to eat it in two sittings it was so large...so good though! 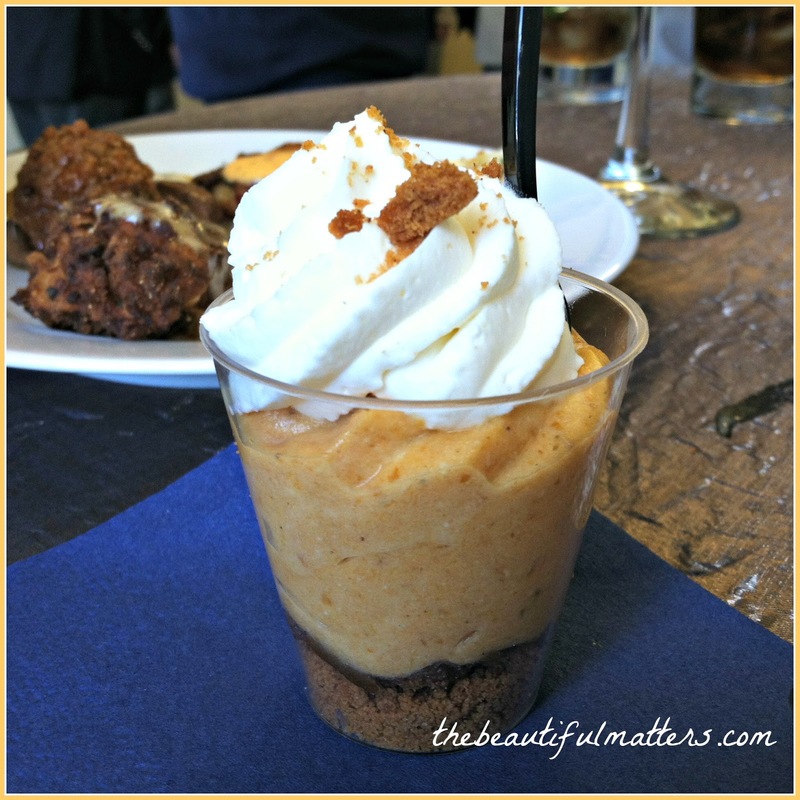 The pumpkin mousse with gingersnaps sounds heavenly! What beautiful treasures are those pieces of your hubby's grandmother's! A lovely win from Patti too. The pumpkin mousse dessert looks yummy. Love anything pumpkin! Thank you for sharing your wonderful tea with us and joining me for tea. Have a beautiful week. How beautiful your china is Deborah! Such gorgeous photos. The Cottage Journal looks a lovely magazine too! I just had hand surgery on my right hand so can’t type very easily but wanted you to know I enjoyed your post today. Loving the china today...and envy you seeing Perlman play...my husband plays the violin so we enjoy violinists. Isn't that so nice that you have your hubby's grandma's treasured dishes?? I hope someone will enjoy mine someday. You're the perfect recipient, Deborah, because you value the beautiful. The pumpkin shooter looks delish! I made a lo-cal pumpkin whip and it was tasty, but I didn't use ginger snaps at the bottom. I like that idea! I look forward to your recipes later this week. 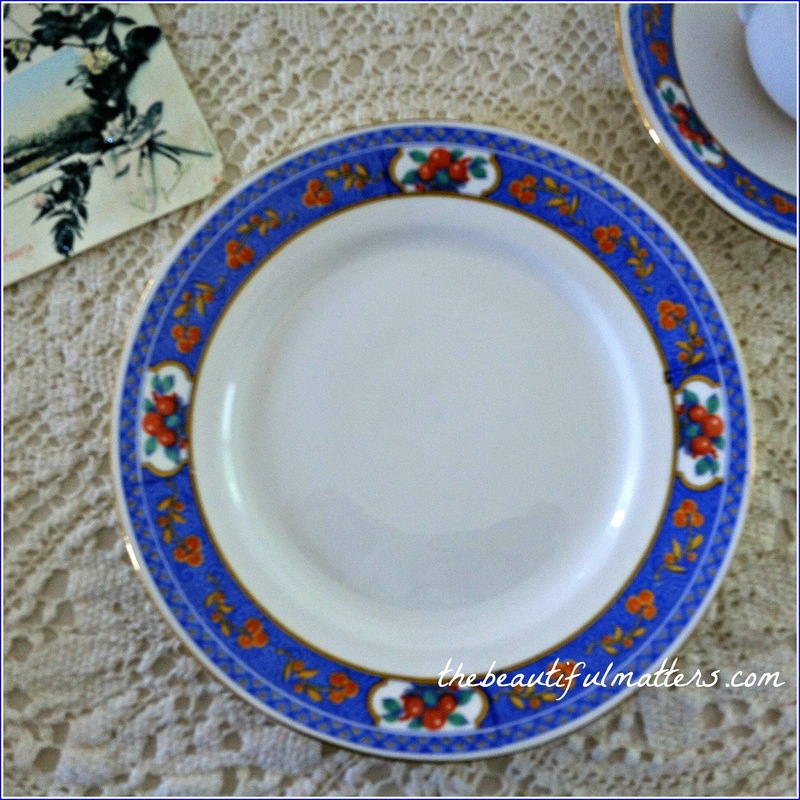 Love the colors of that china pattern, Deborah, so pretty. Hi Deborah, love the gorgeous art deco china. What a beautiful color and design. I also love honey crisp and purchase some very large apples here lately and they are like a meal. I remember going to the apple and cider orchards when we lived in Michigan. It was a yearly thing to do and I miss that even after all these years. Glad your hubby didn't have any ill effects from the bee sting. The concert sounds like it was wonderful and the little dessert shooter looks so yummy good. Your dinner and bread sound so good too. Always nice to get linens organized and ready to use when needed. I finally hung all my tablecloths over rounded hangers and I can see them easily. Thank you for stopping by and so glad your package arrived safe and sound and quickly. What a lovely tea. The shape of the dish your fruit is on is quite pretty. Honey crisp apples, yum yum. This have to be my all time favorite for sure. Going to the orchard when we lived in Canada was always such a delight. We would go to Chudleys in Ontario, and they had wonderful things for the children to enjoy. The gifts you won are lovely, perfect for s cup of tea. That china is so vibrant -- what color! I wish I could share a bit of that pumpkin "shooter" with you; it looks delicious. Can't wait to see your curry recipe. I love currie and naan bread. Maybe I can convince Adam to make us some too! What a vibrant pattern! Thank you for sharing your Ning Poo china. What a lovely table you set. Oh Deborah, this tea set is beautifu!! I just love the colors and pattern. And Honey Crisp apples - yum!! Blessings to you, sweet friend. That is beautiful china. I love the old 30's patterns. I just think this pattern is so cheery and would make any tea time so happy! I always love the rose pattern, but this just shouted HAPPY!